Welcome to Aberdeen High School's AVID program, that’s Advancement Via Individual Determination. A class where 10th graders prepare for college. ABERDEEN, Md. — “It's like overcoming a challenge or obstacle,” said a student. To get over the obstacles and onto the road to success students cruise into Susan Burnett's classroom. “We're hoping, and we know this program helps us eliminate some of the anxiety, helps us make a real push in 11th and 12th grade to find the money, how we can finance our education,” said Burnett. “We're targeting students that maybe college is in their minds, but it's not a sure thing. 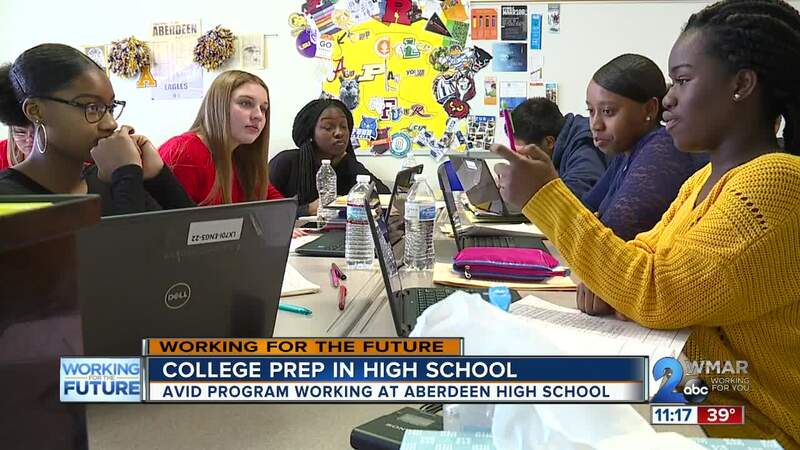 Our main focus is thinking about how do we help those students that want to go to college, get there,” said Laura Garfinkel, AVID Coordinator. “You have to be able to take the word no and learn from the lesson and then apply the lesson to the next challenge you have to go through," said a student. “Using a calendar for each month, when you have dance or games, and when you have school work to do,” said a student. Through life lessons and organizational skills they're learning how to prepare for their future. “I want to become an environmental attorney by first going to college for environmental science getting the basics down and then to law school,” said Stephanie Holley, a senior in the program. Stephanie Holley is off to HCC after graduation she successfully completed the AVID program, another AVID scholar Anna Melendez just found out last month she was accepted in UMBC. “I just screamed at the top of my lungs. I didn't know what to do with myself,” said Melendez. Senior Anthony Chase wants to study graphic design. He says AVID taught him accountability. “It's important because in college you’re not going to have all the teachers on your back trying to help you,” said Chase. For the juniors AVID goes beyond books. “Its basically about life in general. It helps you be open minded and understand other people their points of view,” Dyamond Gillie. “It's helped me realize what I want to do and helped me set up a plan for what I have to do in order to get there,” said Makenzie Severn.